Do we have a stupid President, or what? We stopped at an old photo, men and women lying in their bunks, barely more than skeletons, and if you look closely you can see a sixteen year old boy, looking right at the camera, right into your eyes … you can see Elie. President Obama was talking about this old photo, which is a cropped version of the original. This photograph was taken on April 16, 1945 when Elie Wiesel could not have been in it because he was in the hospital at Buchenwald deathly ill from food poisoning, according to both Night and his memoir All Rivers Run to the Sea. Obama made a big boo-boo in saying “men and women” were in the photo, lying in bunks together. But we already questioned his intelligence, so we’ll pass that by. The bigger mistake he made was identifying the face in the far upper right as Elie Wiesel. His presidential aides should familiarize themselves with this blog before their boss’ next meeting with the Holo idol. This site has proven that it is not Elie Wiesel in that picture, especially here and here. Judge for yourself from this cleaned up, unretouched enlargement of the round-headed man (right), found to be in his 30’s by a computer program designed by Apple. Or check out Computer program judges “Elie Wiesel in Buchenwald” to be 30-36 years of age once again. Compare this face to a real 16 year-old—Nikolaus Grüner in the far lower left of the picture above. And at the end of our visit that day, Elie spoke of his father. “I thought one day I would come back and speak to him,” he said “of times of which memory has become a sacred duty of all people of good will. ” Elie, you’ve devoted your life to upholding that sacred duty. You’ve challenged us all as individuals and as nations to do the same with the power of your example, the eloquence of your words … as you did again just now … and so to you and Marion we are extraordinarily grateful. First, who is we? The entire U.S. citizenry? I’m sure there are many who, like me, opt out of that sentiment and are not grateful to Elie Wiesel. Think how Wiesel uses the word “memory” here. “Memory should become a “sacred duty of all people,” is what he is saying. How can “memory” alone be a sacred duty? But he is meaning a specific memory of the Jewish Holocaust, nothing else. He doesn’t want to say that out loud for all us non-Jews to hear, but we’re supposed to pick it up anyway. We know he means only the memory of the Jewish “holocaust” because he supports the Holocaust Lobby’s condemnation of the Germans’ right to their memories, doesn’t he? If any nation’s memories conflict with the sacred Shoah narrative, they should be suppressed, even criminalized. Wiesel said as much in his speech. In the case of Germany, their non-shoah-approved memories are criminalized (see here). It is the same in Austria and to a lesser degree in many European countries, and Wiesel is on record for favoring criminalization in the United States! 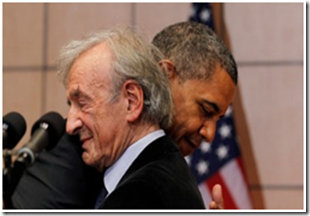 Barack Obama is promising that “as a nation” we will follow Elie Wiesel’s example. You should also be aware that the Shoah narrative is still in flux, still changing, so we don’t even know what we’re in for. Barack Obama, representing the American people, is committing a great injustice to most of us in order to beg for the Jewish vote. How far will we allow the Jewish takeover of America to go? UPDATE: April 26, 8 p.m.
A perfect example of the hypocrisy of Wiesel’s “sacred duty of memory” was offered today in a news story from Europe. The U.S. State Department’s “special envoy to fight global antisemitism” Hanna Rosenthal was touring Latvia after meeting earlier with the mayor of Malmo, Sweden. In Latvia, she pressed the Latvian leadership on their country’s continued commemorations of Latvian participation in the Waffen SS, the military wing of the National Socialist party, which included volunteer divisions from all over Europe. Many Latvians consider the volunteers who fought against the Soviets to be heroes of the nation. To Rosenthal’s objections that this amounted to condoning the killing of Jews, they said their history is “complicated” and they don’t see it in simple right/wrong terms. But Rosenthal insisted, with the weight and power of the United States government behind her, that such a commemoration was “offensive to Jews.” Because it is offensive to Jews, the Latvians’ sacred duty to their memory of resisting the takeover by the Soviet Union cannot be allowed. What could show more clearly that it is indeed only the memories sacred to the Jews that all the world is expected to honor. Our own sacred memories, whatever they may be, must come second to theirs. Who in their right mind accepts such rules? Here a local high school was the setting for another hagiologic revival of the “holocaust” . A week barely after Resurrection Day and days before birthday of Adolf Hitler. I wanted to attend and perhaps provoke my arrest. I was too tired and in place wrote a letter to the newspaper few days before the event more and more encroaching upon the typical Christian holy days. Naturally, they did not publish my letter. The lugubrious routine is now established and sacrosanct inculcating impressionable American youth with debt for these inexpiable crimes against the “Chosen”. The new tree will soon bear fruit and the plaintiff will cry out for restitution in the halls of Congress and churches and schools. Our fearless godless leaders will pay off for the customary but short lived atonement. And then the legislation criminalizing denial or dissension of this new religion that purchases salvation will consummate the crime. Thanks for this enlightening article. Is it surprising that Barack Obama, a typical product of the Chicago Political Machine and recipient of the Dynamite Peace Prize, would seek the endorsement of the CEO of “Holocaust Inc.”? We cannot expect better from democracy. It is media manipulated and thus in control of those who control the media. We know damned well who that is. Having become familiar (just in the past six years) with some of the books, lectures and videos of Paul Rassinier, Germar Rudolf, Fred Leuchter, Arthur Butz, Robert Faurisson, David Irving, Gerald Fredrick Töben, the trials of Ernst Zundel, and the contributions of David Cole, I marvel at how long I and the majority of my fellow Americans have been deceived about a “unique monstrosity” that could not possibly have occurred. I told them about Jewish involvement in getting Wilson to enter a war he had promised to keep us out of, about the Federal Reserve Bank, the Federal Trade Commission, and the Federal Income Tax – all Jewish enterprises. I told them about the 1933 article, “Judea Declares War on Germany,” and the world-wide Jewish boycott of German goods. But none of what I shared seem to really matter to any of them. Only a few were mildly interested. I was surprised at the angry reactions of some of them who see Jews as “God’s chosen people,” and Israel as a victim in the Middle East. I can understand the frustration that Benjamin Freedman must have felt when his warnings went unheeded, and the injustice that revisionists and so-called “holocaust deniers” experience when their characters are assassinated and they lose their jobs, have to pay huge fines, or end up in jail for simply speaking the truth. Well, of course, as shown in the photo, Wiesel and Obama have an genuine affection for each other. As imposters, they are in the same boat. They have more in common than remembrance of the Holocaust! Sheriff Joe:’Tons’ more shocking Obama info. Wiesel has been proven a liar, his own book and words find him guilty. Not to mention the jewish man in the photo [edit: he means Nikolaus Grüner in the lower left – cy] who claims and has written a book about the Wiesel fraud/hoax, that it was his friend [edit: Lazar Wiesel who was registered at Buchenwald -cy] who Wiesel claims to be. When he was invited to meet Wiesel he said, “I was shocked to see a man I had never seen before.” He also said that Wiesel claims to be born in Hungary (which is where the man Wiesel claims to be came from) yet Wiesel can’t speak a word of Hungarian and speaks English with a French accent. Whatever happened to our laws? Al: Grüner exaggerates, and sometimes lies, also. Wiesel declined to speak Hungarian when he met Grüner in Sweden, but that doesn’t mean he can’t speak it. However, he has never really been put to the test, has he. A rabbi in Hungary said he has heard Wiesel speaking in Hungarian, which proves nothing. Wiesel mainly spoke Yiddish growing up. It is Grüner’s subjective opinion that Wiesel speaks English with a French accent. It’s just an ugly accent to my ears. Wiesel is fluent in French from living there from 1945 (if not earlier) to 1955. If you’re going to question the Wiesel phenomenon, you have to question Grüner’s claims also; you can’t simply take them at face value. Once again, this has nothing to do with our laws, as it is not covered by U.S. law, nor should it be. If Wiesel has misrepresented himself for profit, this would be a legal issue of fraud … but impossible to prove it in court in our current political and legal climate.